We stayed here for 2 weeks at the beginning of July. It was a lovely holiday, the hotel was very clean. The maid was in daily making the beds and animals out of towels. Our fridge was stocked twice a week with soft drinks too. The food was average for a hotel in Egypt. But as with every all inclusive, it gets repetitive after a fortnight. The restaurant was like a zoo but if you make sure you tip they'll find you a table. There are two large pools and three next door in the Garden Beach that you can use as well. We never actually used the pools next door but did have a look round one day and they were pretty much empty. It seemed that everyone next door were using the Mamlouk pools. To get a decent sunbed you had to be up at silly o'clock because the other nationalities were putting towels out at 5 o'clock. They also hoarded beds. And you can’t say that the English were partly to blame for this because they were so little of us. The resort was mostly Germans, French and Russian. They were also very rude; pushing you out of the way; jumping the cue's etc. After a week you kinda got excited when you heard an English voice, it was that bad. The beach was at the end of the resort and was shared with Garden Beach. There's a beach bar down there too. After being in Sharm last year it was nice to be able to walk straight into the sea to swim, although you can still go off the pontoon to see the fish. The hotel is very close to shops. You could go left when leaving the hotel and go to the Sunrise mall and the Pic Albotros mall or go right and go to the Cleopatra mall. On each side there is a fixed priced shop. The Senzo mall is a 10 minute walk away (you can see it from the front of the hotel). There are shoe and clothes shop, a supermarket (which a good place to get crisps from! ), a few restaurants and a McDonalds (which is alright if you get bored of the hotel food. It is really cheap). The shows on a night were all right if you like that kind of thing but they didn't float our boat. We sat in the 24-hour lobby bar or at the beach bar (which was open till midnight). There was entertainment during the day at the entertainment pool, aerobics, belly dancing etc. That pool also had two slides which were fine but even though there was a life guard, you still had to watch the kids because it got very rowdy. Overall I would go again and I've even recommended it to my parents who are now going next year. We stayed at this hotel for seven nights at the end of May 2011. Our only disappointment is that we didn't stay longer. The Hotel is within comfortable walking distance from three Malls/Shopping Precincts but about 20 minutes by taxi from Hurghada itself. (However, for anyone who hasn't visited Egypt before every shopkeeper will invite you, using various tactics, into their premises. The smiling and politely declining gets a bit much as it appears to happen at every shop, making window shopping a bit stressful). The staff were faultless in there attitude and helpfulness; our room was meticulously cleaned by Mohammed every day, with a different towel sculpture on the bed on our return. At the time of our visit the majority of the guests were Eastern European or Russian and the buffet restaurants seemed to be, in the main catering towards their tastes but it was all well cooked, well presented and so much choice that we could always find something we liked. The A la Carte restaurants ranged from very good to excellent. The animation team worked hard during the day keeping those who wanted entertaining entertained and in the evening, put on a different show every night in the Ampitheatre which was at the Sister Hotel next door, where all the facilities are shared. We have and will recommend this Hotel to our friends and we are already making plans for our second visit. Visited the Sunrise Mamlouk with friends. I cannot fault this hotel in any way. The staff aimed to please throughout the whole holiday making our stay there fantastic. Our room was immaculate and the cleaner came in each day leaving fresh clean towels, he also left a different design he made with towels and petals on our bed each day (nice touch). As far as the food was concerned, there was something for everyone. The two restaurants (Asian and Mexican) were good and a nice change from the main buffet restaurant. The hotel staff were the most polite and helpful I have ever met, nothing was too much trouble. We did tip throughout our stay as the service was excellent although we didn’t feel under pressure to tip as we had in previous hotels in Sharm el sheikh. The hotel catered for everyone from families with small children, to single couples and the variety of pools meant that if you wanted to be quiet and away from the entertainment this was easy to achieve. We will certainly go back to this hotel again in the future. just returned from this fantastic hotel the staff were wonderful nothing was to much trouble. ibrahim(bar manager) and his staff were brilliant always ready for a chat and a laugh they are worth there weight in gold. rooms were kept spotless, the towel guys were great a little tip goes along along way. food was ok but a little cold in the main dining area but plenty of choice even for picky eaters like me. i carnt wait to go back this time next year, as the weather was just right. hot but bareable. i would like to thank all the staff for making it a wonderful holiday. Stayed at this hotel for 10 days and would not visit again. The hotel rooms and communal areas are beautiful but the pools and the area where they cook snacks near the pool are an absolute health hazard. I went to collect a pizza for lunch and one of the staff was smoking not 2 foot away from where the cooking was being done. I never saw them wash their hands and everything was put on your plate by the staffs hands Not wearing gloves!! !My son had to visit the clinic for stitches to his leg and the same sheet on the couch was used for everyone and never changed hence my son bleeding on it it still did not get changed, There was sticky tile type things un der the treeatment couches covered in cockroaches and other bugs. This was stil there 5 days later. The doctor only used gloves once and before he re-dressed my sons wound wearing them he swatted a bug and killed it with the same gloves. Scary or what,On the food front the food in main buffet was terrible I had to survive on pasta and bread everytime I went in. They did have roast beef and other meats if your teeth were like saws and could chew through it. The Mexican a la carte was lovely but must have been a little spicy as it upset my stomach but I had to go again as I could not tolerate one more plate of pasta and bread. The staff are really really lovely people always smiling and wanting to help you and this is what makes the resort. Sunrise Mamlouk Palace is a beautiful hotel spotless the hotel staff are very helpful and are always keen to speak to you to improve their english. The Sunrise Garden Resort is adjoined so we visited this hotel but were not very impressed the Mamlouk is much more appealing. There are several restaurants within the hotel grounds which as an all inclusive guest you can use the only unfortunate thing is you have to start to queue for the reservations at approx 12noon and collect a ticket which can mean you wait up to 40mins to reserve your table at the chosen restaurant this should be looked at because who wants to waste 40mins sitting waiting for the staff to begin reservation bookings. Having said that the food in the Asian restaurant is excellent we could hardly believe this was also included in all inclusive deal the service and quality of the food was fantastic. There is no entertainment none that we discovered anyway there are the bars to sit in and a night club with a DJ playing music. The beach area again was brilliant just a short walk from our room comfortable sun beds plenty of shade although this time of year the water was too cold to venture in. We were there for the New Year which was a bit of a dissappointment as they catered for far too many people other hotels bought tickets so the venue was packed, queues upon queues for the food which was beautiful and varied but by the time you got back to your table it was luke warm. The entertainment that night was diabolical so we left early and went to the hotel bar. If you book this hotel request a room beginning with numbers 27 or 29 as these have the sunshine. stayed for feb half term after canx booking to makadi palace. i loved the hotel fab grounds ,really spacious and well kept,never an issue getting sunbeds.i enjoyed the daytime aerobics and kids loved the aqua aerobics everyday complete with club dances! the entertainment team work really hard, evening entertainment is fairly good, lots of other nationalities , not many british(this didnt really bother us ). i enjoyed the food too,especially the mexican restaurant, kids loved the pancakes each morning.the bedroomswas huge 2 rooms with a bathroom in between.hotel staff all very attentive and the place is very keen.i would love to go back but after searching seems no uk operator now has rooms for families of 4 for next year( only offering 2 rooms which is very expensive) maybe the family rooms are being sold to other countries. 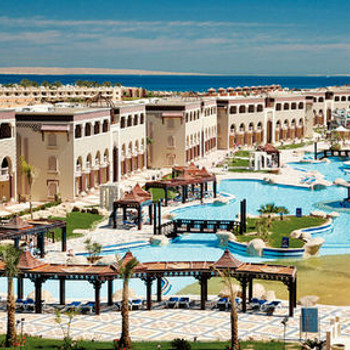 also did the boat trip booked from beach and bartered the price right down,definately negotiate the price.our 2nd holiday to egypt and we would love to go again to this hotel. Ok, the important bit! Tis not 5* by UK standards but a damn good effort is being made to get it somewhere near, I would say a 4* at the very worst. Mamlouk Palace is a big hotel but it's not without it's staff, there seemed to be 100's of them & never once did we wait (or want) for anything. I could write thousands of words here, instead I'll try to sum up in single words/sentences as much as possible. Friendly Staff (nothing was too much trouble). Fab food & drink (no queues at anytime). 2 huge pools (1 heated to 29c throughout the winter) & both suitable for children or those not overly confident as they are shallow enough to walk in. Very clean beach with a windsurf school, it's own jetty which leads out to a small reef suitable for snorkelling whilst the sea is very shallow (artificially made) so again suitable for the less able swimmer. The sister hotel next door has a dive schol & offers snorkelling trips via a local boat but it's nearly double the cost of those in town.